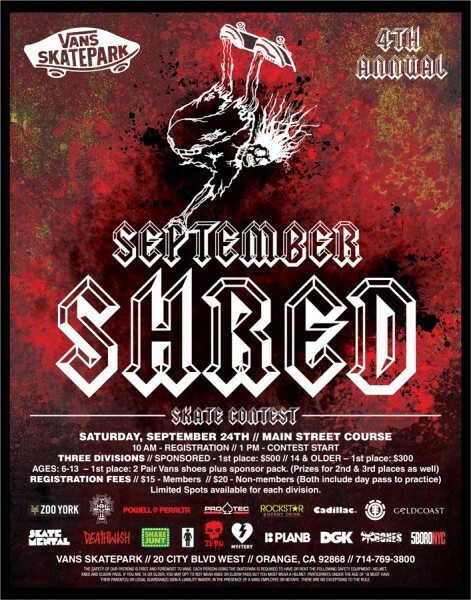 Vans Skateparks in Orlando and Orange will be hosting the 4th annual September Shred Skate Contest this Saturday, September 24. Registration starts at 10a.m. and the contest gets rolling at 1p.m. 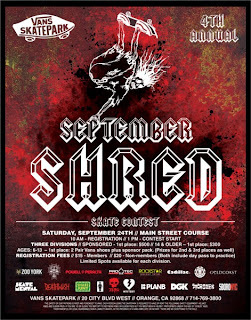 Prizes include $500 for 1st place in the sponsored division, $300 for 1st place in the ages 14+ division and giant sponsor prize packs for 1st place in the ages 6-13 division. Check out the flyer for more details.